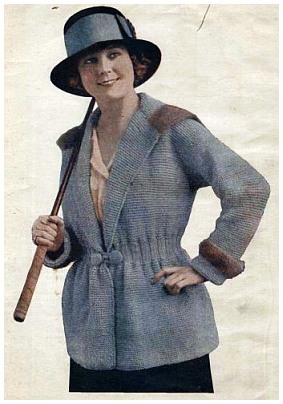 This is one of the most stylish vintage sweater knitting patterns I’ve seen. Unfortunately, once again, there’s no size or swatch information provided. There is a clue in the first step that indicates the back of the sweater is 119 stitches wide and measures about 24 inches – hopefully, that’s enough to give knitters an idea of how large a sweater this vintage knitting pattern makes. I welcome comments and suggestions on making this knitted sweater pattern but as I do not knit, please accept my apologies that I unable to offer any assistance. 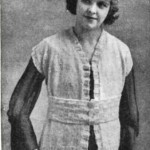 This knitted sweater requires five skeins of knitting-worsted, and four balls of Angora; electric blue for the body of the garment, and gray Angora were combined in the model, but other colors may be chosen at pleasure. 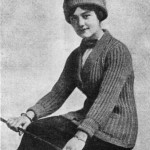 The work is done in plain knitting, back and forth, with ribbed belt. With the knitting-worsted and No. 5 needles, cast on 119 stitches for the back, which will measure about twenty-four inches, and knit 48 ribs, or 96 rows. Next row, * narrow, knit 4; repeat from *. Then change to No. 12 steel needles and do 20 rows in triple rib (knit 3, purl 3) for the belt. Change to No. 5 needles and knit 20 ribs; then decrease 1 stitch at end of needle every other row five times. Knit 29 ribs plain, or without decreasing. Next row, knit 34 stitches, slip them on to a spare needle, bind off 21 stitches for neck, and on the remaining 34 stitches, knit 4 ribs; then cast on 30 stitches at the neck, knit 29 ribs, increase 1 stitch at armhole every other row five times, and knit 22 ribs plain. Change to the steel needles, and work the belt as directed for the back, (purl 3, knit 3,) starting from front edge. Having completed the belt—20 rows of triple rib—change to No. 5 needles; * knit 4, increase 1 stitch, repeat from *. Then knit 48 ribs and bind off on the wrong side. Knit the other front to correspond, omitting buttonholes if these are used. For the sleeve: Working on right side of sweater, pick up 1 stitch on each rib around the armhole, 72 stitches in all; knit 8 ribs, then decrease 1 stitch at each end of needle every 8th rib, eight times. 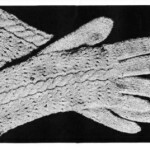 Change to steel needles and knit 12 ribs for the wrist; change to the larger (No. 5) needles, * knit 4, narrow; repeat across, then knit 12 ribs, join the Angora, knit 7 ribs, and bind off. Collar: Using No. 5 needles and the knitting-worsted, cast on 65 stitches; knit 28 ribs. Join the Angora wool, knit 11 rows, increasing 1 stitch at each end of needle every other row, and bind off. Working on right side of collar pick up 1 stitch on each rib at the side, knit 11 rows, increasing 1 stitch every other row toward the corner and keeping the neck edge even, and bind off. Make the other side of collar to correspond and sew up the mitered corners. The border of Angora wool may be as much wider as one chooses to make it by adding more rows or ribs. 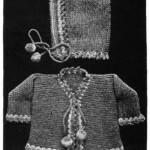 Two large buttons covered with the knitting-worsted—either knitted or crocheted—and furnished with a loop sewed on each side, are used to fasten the belt. For the buttons: Using a bone hook which will carry the yarn, make a chain of 3 stitches, turn, and in 2d stitch of chain make 8 doubles; in next round make 2 doubles in each stitch, working in both veins so there will be no rib; then make 1 double in 1st stitch, 2 in next, and repeat. Continue to work around and around until you have a circle which will cover the button-mold—5 rounds in all were required for top of buttons used on model, work around without widening, slip in the mold, then * miss 1, a double in next, and repeat until the cover is closed. If preferred, knit a tiny square as you did the body of the garment; and use this to cover the mold, drawing it snugly over, and fastening underneath. For the loop, make a chain of 30 stitches, turn and make a double in each stitch; fasten securely beneath the button.